When The Park, a small sports bar chain, began looking to expand beyond its Austin birthplace, it bypassed Houston and headed straight for Big D.
With its confluence of marquee sports teams across every major league and its never-say-die fans, North Texas has become a magnet for game-focused restaurant chains and independents. All are hoping to score. The sports bar occupies a unique, if amorphous, niche within the casual dining segment. The growth of sports bars — both in number and in sales might — comes as the broader casual dining segment has struggled. Chicago-based Technomic tracks sales at the Top 500 U.S. restaurant chains. In the 2015 list, about 13 percent of casual dining sales were at “sports bar” concepts. Sales at sports bars on the Top 500 list grew 7.7 percent in 2015 to $7.3 billion, compared with 2.9 percent sales growth for the broader “varied menu” category, Technomic said. 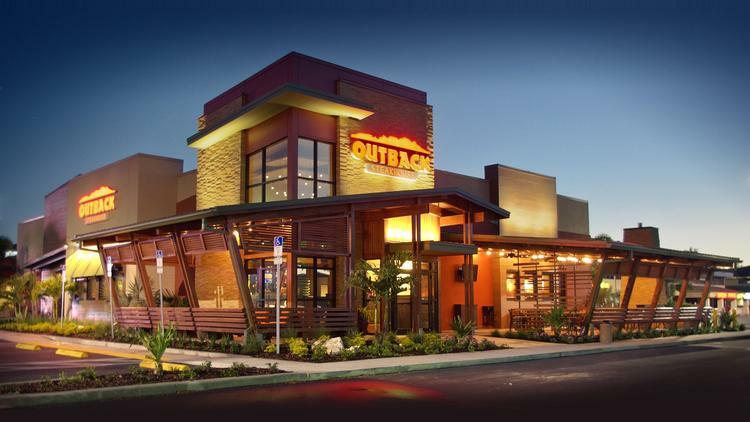 The top sports bar chains grew their location count by 4.6 percent in 2015 while major full-service chains overall grew at a rate of 0.9 percent. North Texas is one of about a dozen U.S. markets with all four major sports leagues — NFL, NBA, NHL and MLB — along with soccer and numerous alums from powerhouse college programs. And it’s increasingly a draw for migrants from other major sports towns, who bring their viewing loyalties with them. That makes North Texas fertile ground for expansion-minded sports bar operators. It’s also home base for several of the major chains including Twin Peaks, Boston’s and Dave & Buster’s. Dave & Buster’s was born in Dallas in 1982 as a hybrid restaurant/playground that enticed guests to “Eat. Drink. Play,” with a focus on food and electronic games. In 2011, the Dallas-based chain added “Watch,” as part of a full-court-press designed to include a branded “D&B Sports” area near the restaurant bar. Today, all 86 U.S. Dave & Buster’s locations include amped-up “sports viewing packages.” About 80 percent are officially branded with D&B Sports sections that bring the restaurant TV screen count up to about 40 (compared with 20 pre-sports push). That includes two or three 180-inch screens, according to Sean Gleason, chief marketing officer for Dave & Buster’s. The sports theme has helped Dave & Buster’s appeal to millennials, who gravitate to the communal dining spaces and party-like atmosphere. The bar shows every NFL game on Sunday. As the Cowboys battled the New York Giants, the chatter among the sports fans was constant. A taunt here, a high-five-punctuated boast there. Cheers and groans were interrupted by the occasional “Over here” as patrons vied for attention from a worker lobbing Dave & Buster’s T-shirts into the crowd. Near the center of the bar area, Brad Cotton, 33, and his wife Donna, 42, of DeSoto said they can be found at a sports bar any given Sunday, unless family members are hosting a watch party. Donna noted that the uniform of the day was predominantly blue and white. None of the sports fans interviewed were surprised that North Texas is home to a growing sports bar scene. “Sports are big in North Texas, whether it’s NASCAR [or] football,” said Daryl Hope, 47, who is moving soon from Forest Hill to Rockwall. Hope prefers his perch at Dave & Buster’s to stadium seating because it allows him to watch multiple games at once. That’s important, he said, since he’s big into fantasy football. Try 14 leagues big. The introduction of fantasy football to younger consumers and mainstream consumers, including women, has given the sports bar segment a nice lift, Tristano said. Despite the fan enthusiasm, North Texas remains a challenging market as operators compete for both consumers and investors. In 2000, when the Canadian-based pizza and sports bar chain Boston Pizza began investing in a U.S. expansion, it headed straight for North Texas. The U.S. headquarters is in Dallas and a corporate restaurant that doubles as a training center is in Irving along busy Interstate 635. Three more franchised locations were added locally through 2007. Then the company was hit with a blitz known as the great recession. From about 60 U.S. locations, the brand dropped to about 25. No additional locations have opened in North Texas in the past 9 years. Nationally, the brand gained some yardage and is now back up to 29 locations. And while the company has found a franchisee to grow in West Texas — two locations will open in El Paso next year — the company has yet to find the right local combination of investor and real estate for North Texas. “There’s lots of competition,” said Ken Phipps, director of franchise development for Boston’s Restaurant & Sports Bar, the U.S. arm, as the lunch bunch watched highlights from the weekend’s sports matchups. Three different franchisees own the three noncorporate D-FW locations. Now the company, like many major chains, is looking for large investors who can open more than one location. “We really want to grow our D-FW market,” said the North Texas native. “It’s our home. It’s our backyard for the U.S., and if we find the right partners we could easily add 15 restaurants in the next five years. This market can easily handle that. Fast-food joints aren’t hitting the snooze button anymore. McDonald’s Corp.’s decision to start selling Egg McMuffins all day long last year — meant to help sales during lunch and dinner time — has boosted its morning business as well. That, in turn, has kicked off a scramble among its rivals to find new ways to combine eggs, potatoes and meat for a tasty breakfast. The latest example is Burger King’s Egg-Normous breakfast burrito, which is being introduced in the U.S. on Tuesday. It’s stuffed with sausage, bacon, eggs, hash browns, cheddar and American cheese and served with picante sauce. The home of the Whopper, which still serves breakfast only during morning hours, also recently added a supreme breakfast hoagie and got rid of slower-selling English muffin sandwiches. Along with adding and deleting items, Burger King tweaked its smaller egg burrito earlier this year, removing green and red peppers and replacing them with hash browns. Taco Bell revised its morning offerings in March to include $1 options such as skillet bowls and sausage flatbread quesadillas. Subway Restaurants just announced buy-one-get-one subs for the month of May. The catch: They have to be purchased before 9 a.m. And Dunkin’ Donuts revamped its menu boards to focus on all-day choices and started advertising $1.99 Coolatta drinks that are sold at all hours. The changes come as more U.S. consumers grab eggs and coffee outside the home, according to a study by researcher GfK MRI published by EMarketer.com. Last year, more than 34 percent of Americans reported buying breakfast at fast-food restaurants, an increase from 32.8 percent in 2011. Meanwhile, fewer consumers said they’re dining out for lunch and snacks. Dinner increased less than 1 percent. McDonald’s all-day breakfast in the U.S. has helped turn around its worst sales slump in more than a decade by drawing more customers throughout the day, including the morning. The plan is surpassing its goals. Items like Egg McMuffins and hash browns fueled a 5.4 percent U.S. same-store sales increase at McDonald’s in the first quarter. That’s stronger than the most recent quarterly gains posted by Burger King, Dunkin’ and Taco Bell. “It’s helped drive success, which they haven’t seen for several years,” said Darren Tristano, president of industry researcher Technomic Inc.
After losing customers to McDonald’s all-day Egg McMuffins, Jack in the Box Inc. has been advertising a triple-cheese and hash-brown breakfast burrito. Same-store sales at company-owned Jack in the Box locations may be down as much as 3 percent in the recently ended quarter, the company said in Februar y. The chain also is adjusting and improving other breakfast items, CEO Lenny Comma said during a conference in March. Dunkin’ Donuts said last month that its new menu boards are helping drive breakfast-sandwich sales. It’s also focused on introducing mobile ordering and will start a 1,650-store test in metro New York in May to get customers their morning meals even faster. CEO Nigel Travis says McDonald’s push has actually helped Dunkin’ in the breakfast battle by highlighting that the doughnut chain has the same menu all day. Still, the change has increased competition for diners’ dollars. “Clearly, the value war is pretty intense,” Travis said in an interview. Has your sushi been a bit different lately? Maybe longer, pudgier and rolled up with rice, protein and vegetables? You know, kind of like a burrito? Actually, let’s call a spade a spade. Your sushi isn’t just like a burrito. At an increasing number of eateries, it is, in fact, a burrito. The sushi burrito has officially joined the ranks of such culinary chimeras as the Cronut and the ramen burger, seducing both eager customers and the restaurateurs who want to feed them. Even as diners eat fewer Chipotle burritos, sushi burritos are gaining traction around the country and in the Washington area. 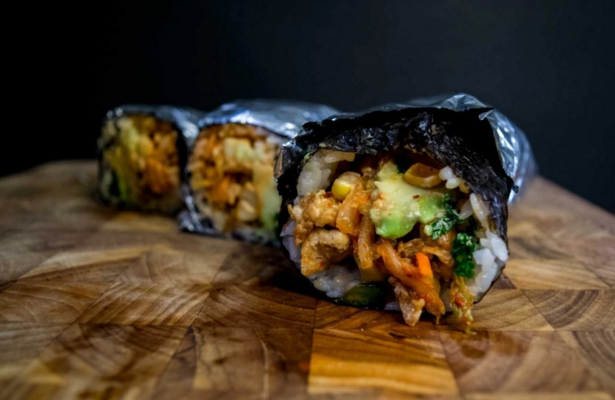 The latest purveyor joined the D.C. scene last week: Seoulspice in NoMa, which sells what it calls the Korrito, a Korean-style burrito wrapped in seaweed and filled with sushi-grade rice, plus a variety of meats, vegetables and sauces. Eric Shin, a percussionist for the National Symphony Orchestra, said he hit upon the burrito concept almost by accident about two years ago. He’d originally planned to offer kimbap, Korean rolls sliced into bite-sized pieces. Unfortunately — or perhaps fortunately — the machine he bought to cut them destroyed the food. “It was a huge mess,” he said. Amid the disappointment, Shin’s wife was so hungry she just picked up an uncut roll and started eating it like a burrito. “It just sort of stuck,” Shin said. Darren Tristano would tell you that the popularity of the sushi burrito is no accident. The president of Technomic, a Chicago-based firm that specializes in food industry analysis, said a number of factors are at play. Primary among them is the form itself. Four years ago, a Technomic concept study predicted “burrito-inspired” would be a common industry trend. Good call. Sushi burritos have also been propelled by the growth in fast-casual dining and its build-your-own mentality, Tristano said. And with sushi available at almost every grocery store these days, it’s become an accessible and familiar food. Like so many food innovations, sushi burritos gained traction on the West Coast and are continuing their march across the country. Sushirrito, a five-location California chain that bills itself as “the original sushi burrito concept” debuted in San Francisco in 2011, the same year the Jogasaki food truck hit the streets of Los Angeles; the Kome truck peddles sushi burritos in San Francisco. Even given the wave of sushi burritos in California, lifelong friends and first-time restaurateurs Mike Haddad and Travis Elton weren’t quite sure what to expect when they debuted Buredo in downtown D.C. last summer. “We didn’t know how it would be perceived,” Haddad said. When the doors opened and curious diners snaked down the block, “I said, ‘I think we have something here. '” Something big enough that the duo is close to opening a second location, near Dupont Circle. Haddad and Elton think they’ve hit on customers’ interest in food that is fresh and healthful. Darren Norris knows he’s tapped into that market at his almost year-old Maki Shop on 14th Street NW, where evenings will see diners trickling in from CrossFit and other nearby gyms. The owner of the late Kushi in Mount Vernon Triangle — whose six-ounce maki fall somewhere between the size of smaller sushi and sushi burritos — said his “sushi hand rolls” are “a lifestlye product” for on-the-go diners. “I want to be that thing that you could eat three days a week and not feel guilty about it,” Norris said. Their size and torpedo shape notwithstanding, sushi burritos have forced us to reconsider what we think of as sushi, especially when it comes to fillings. At Buredo, nori is wrapped around everything from yellowfin tuna or salmon sashimi to tofu and pulled pork shoulder. Seoulspice’s Korean-accented items include bulgogi beef, pickled radish and, of course, kimchi. At Burrito San in Miami, you can have your sushi burrito by way of the Philippines (braised pork, banana ketchup) or India (spiced chicken, potatoes, curry). Denver’s Komotodo not only sells rolls such as the Bee’s Knees (fried chicken, asparagus, bacon, Monterey Jack cheese) and Fish n’ Chips (white fish, slaw, potato chips), but also gives you the $2 option to have your burrito deep-fried. Really, the question these days is not what can you put in a sushi burrito, but what can’t you? “I’m not saying burrito sushi isn’t true sushi. Sushi is vinegared rice,” he said. Sticklers could even contest whether Okochi’s food is “true” sushi, since the chef said he’s developed his own style at his restaurant. As long as sushi burritos don’t take over the entire sushi market, he’s fine living side-by-side with them, he said. In fact, self-professed sushi lovers Haddad and Elton view themselves as “introducing sushi to a new audience,” Elton said. “It is definitely opening up people’s minds,” Haddad said. Seoulspice’s Shin said he’d like his Korritos to similarly encourage diners to seek out the kind of traditional Korean food he grew up eating. Even with more people like Haddad, Elton and Shin getting in on the sushi burrito game, Technomic’s Tristano said there’s still room to grow in the genre. He said reasons why sushi burrito establishments are still less common than their popularity might indicate include food safety issues with sourcing and serving raw fish (although many burritos rely on cooked, fried or even vegetarian fillings) and the fact that the concept is hard to replicate. “I think it’s really difficult to pull off,” Shin said. “Most of the restaurants that open up are afraid to do something different.” Shin said he had to battle through questions and skepticism from his own family (his parents ran a Korean restaurant in Atlanta), some of whose recipes he’s using at Seoulspice. “I caught a lot of s— from my grandma,” he laughed. The Buredo duo was slightly more measured. Correction: A previous version of this story misidentified the geographical origins of Jogasaki and the Kome truck. This version has been updated. You are currently browsing the archives for the Daypart category.